Protection has never looked this elegant thanks to our all-new shimmering CandyShell Clear with Glitter phone cases. Dress up your phone in these chic additions to our line of CandyShell clear phone cases and you’ll be ready for whatever your night or day throws your way. 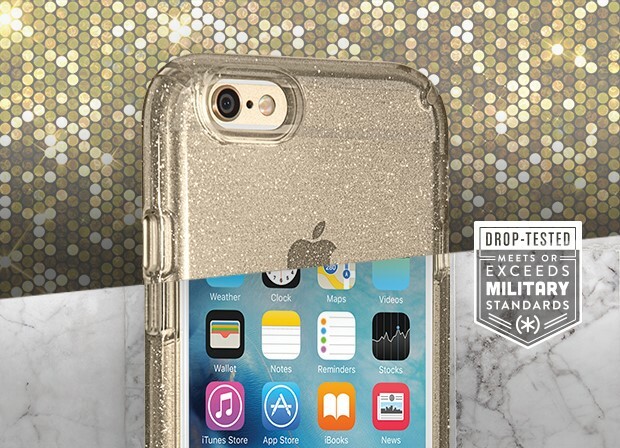 Not just a pretty face, CandyShell Clear with Glitter offers proven protection in a beautiful case. Meeting all of the Speck military-grade protective standards of CandyShell Clear, the #1 best-selling clear smartphone case in the US*, CandyShell Clear with Glitter provides two layers of slim, durable protection and a raised bezel that will guard your screen from direct drops and scratches. Ready to party, this shimmering clear phone case will stand the test of the time. With the help of an all over glitter that is embedded in the case and won’t rub off, along with a scratch resistant surface that resists UV yellowing, you can rest assured that the sparkle is here to stay and will shine on till the sun comes up, again and again and again. If you’re looking for a glitter iPhone 6 case or a glitter Samsung Galaxy S7 case that’s subtle, elegant and protective, look no further. CandyShell Clear with Glitter is available now for iPhone 6s/6, iPhone 6s Plus/6 Plus, iPhone SE/5s/5 and Samsung Galaxy S7/S7 edge. Go on, get your shine on today!